I found this today while swapping the slicks around. I put new brake pads on not that long ago and probably just missed it then. I had swapped the slicks around and had already put the right side on when I found a wheel weight in the floor on the left side. 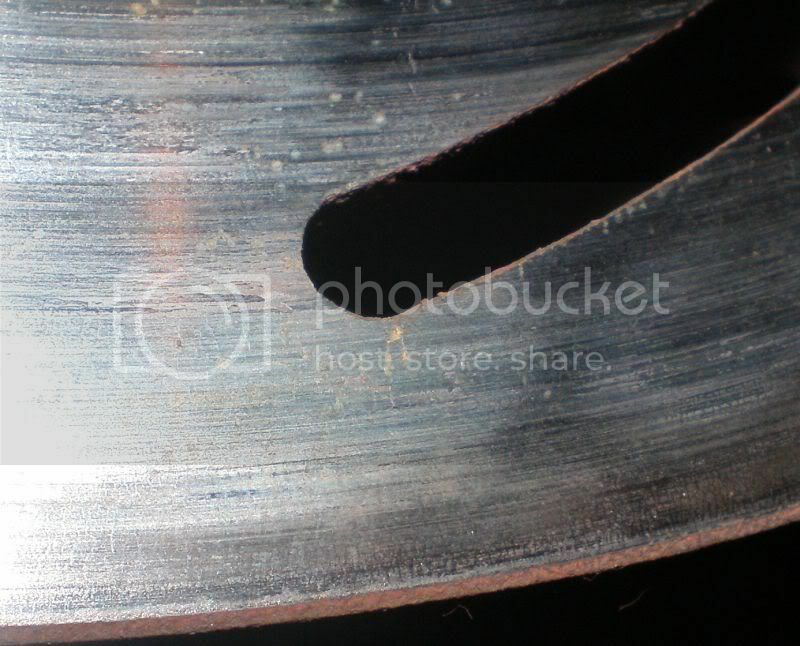 When I went to look at the inside of that wheel to see if I had knocked the weight off I saw the rotor. Funny thing is I wasn't going to swap the slicks around but decided to last minute and then knocking the weight off made take another look. I just have to thank God he was watching over me again. Our last UMTR race is next Saturday and I was just getting everything ready for that. I looked close at it in other places and can see signs of cracks starting. Might be a good idea for those of you that haven't looked at yours lately to take a good look. I know I don't need this at 150+ MPH. Yeah, that could have been nasty all right! Glad you found it Chuck. BTW, who's rotor is that cuz it looks very much like the ones on my dragster? It's a Strange rotor Ken. Looks like you treed me there Barry. I'm not sure how many runs I have on these but they are the original rotors from when I built the car and this is the 7th year I have raced it so I'm sure it's over 600 runs. I probably only have about 10 runs on the new pads and they were the originals too. I'm sure there had to be some cracking when I changed the pads I just didn't look. I know better now. The Vega was probably heavier than the Beretta. Yup, the dragster has Strange brakes on it too? The Camaro has Wilwood stuff on it and I've never replaced the pads on that thing in 5 years of use. I don't think Strange has an exclusive on this type of failure and it won't stop me from using their products. It's a lightweight racing part that gets a certain amount of abuse. 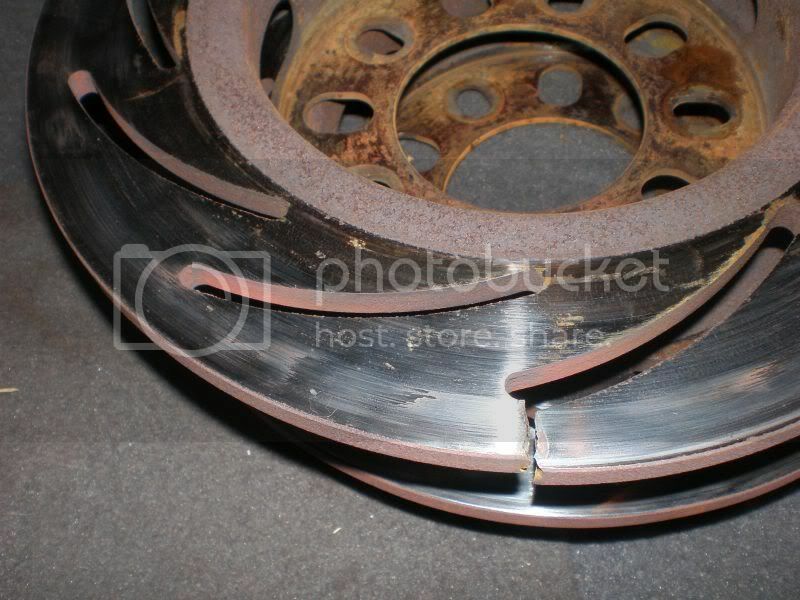 I don't think the non-slotted rotors do this but these do a better job stopping. Replacing them every 500-600 runs isn't such a bad deal. Maybe I should get in the habit of using the 'chute? I am thinking about deburring the slots on the replacements because it looks like that's where the cracks start. Anyone else here try that? I agree Chuck..Good idea about the deburr ..Island Dragway has a short shut down as it was opened in 1960 ..Now that alone is hard on brakes if you don't use the chute..As I never did and maybe I swaped them out before I needed to but did it for safety reason..